Hundreds at the Hevron Conference, where experts explain that there are no real barriers to annexation of Judea and Samaria. More than 600 people took part Thursday in the Hevron Conference on the topic of annexing Judea and Samaria (Shomron). Experts who spoke at the event said that many of the so-called barriers to annexation actually pose no problem. Attorney Itzik Bam of the Land of Israel Legal Forum told the audience that legally speaking, Israel is able to annex the land. What currently exists in the region is a “sovereignty vacuum” where no country claims the land, he said. Another speaker, Samaria Regional Council head and attorney Gershon Mesika, said Israel will find a surprising amount of support if it states its claims openly. Mesika noted that in his own meetings with leaders in Israel and abroad, even Arab leaders showed respect for Israel’s claim to the land when it was stated proudly. Former Israeli attaché in Washington Yoram Ettinger, a demographer, said that Israel would not risk its Jewish majority by annexing the region and giving citizenship to the Arabs currently living under the Palestinian Authority. Ettinger has done several studies showing a clear, consistent and growing Jewish majority in Israel, Judea and Samaria. Caroline Glick of the Jerusalem Post said that if Israel is to extend its sovereignty over Israeli towns in what is known as “Area C” – parts of Judea and Samaria currently under Israeli authority – it should annex the rest of the region as well. “The price will be the same either way, so it’s a shame to spent it on just half… “ she said. 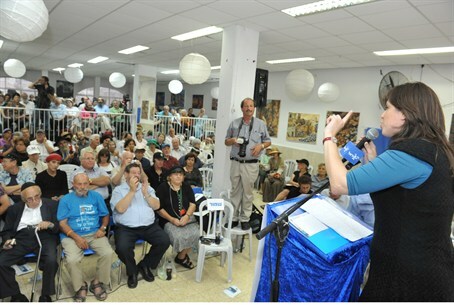 Among the other speakers were coalition head MK Zev Elkin (Likud), MK Miri Regev (Likud), and Israel Prize winner Geula Cohen. Cohen recalled her battle in Knesset in favor of extending Israeli sovereignty over parts of Jerusalem that had fallen to Jordan in the War of Independence.